I'm back today with another card using Penny Black stamps. This lovely background stamp is called Glory of Modesty, and I stamped it using clear ink, then embossed it with a bright limey green. Then I used a pink marker to give some detail to the flowers. After trimming to the size I needed, to add a little more interest, I cut the panel into 4 equal parts, and then reassembled it onto a pink panel. I glued that onto my card base, stamped the sentiment from the Friendship set, and added some punched butterflies embellished with pearls. I used an older Hero Arts stamp, Stitched Flower Trio, for my stems and leaves. I used my Candis to make some flowers; I used these sets: Flower Power Mia for the petals, and Coconut Macaroon for the dotted centers. I layered my stamped panel over an aqua chevron paper from Simple Stories Sn@p! Color Vibe, and stamped an aqua-embossed sentiment on vellum. I paired these up with a paper from MME's Lost & Found Two Blush paper pad, and the Hero Arts Starbursts stamp, embossed in white. I framed my panel with a bracket punched edge (Fiskar's) and added a hot pink silk ribbon and my sentiment from My Happy. I first stamped my own background using elements from the Simon exclusive stamp set Flower Friend, coloring in the flowers with colored pencils, then using the Gingham Galaxy Candis as my flower centers. The sentiment is from Hero Arts Truly Appreciated, stamped in Charcoal mid-tone ink. The inks for the background are Brilliance Pearlescent Coral and Sky Blue. Our Heidi has provided another $50.00 gift voucher for the random winner of the challenge this week! What would you get at the Simon Says Stamp Superstore? I'd love it if you'd hop on over to The Craft's Meow blog and leave me a little comment! Thanks so much - have a GREAT day! Hello, all! I trust your weekend is off to a great start! I'm here today to share a card I made using some Penny Black stamps, combining them with some design papers in colors that I love. I knew I wanted to paper-piece this floral stamp called Flower Poetry, and since I love this little ditzy floral from MME's Collectable Notable collection, I pulled the colors from it. So I stamped the Poetry stamp 5 times, on pale and medium aqua, a yellow, a gold and an orange solid, then cut the flowers and leaves out and pieced them back onto the pale aqua base, attaching the flowers only in their centers so I could lift the petals a bit for dimension. (I also used a marker to add a bit of tone-one-tone color to them and added some MME enamel dots to the centers of 2 of the flowers). Then I framed the pieced circle with a Nesties scalloped circle die in orange. My other little panels are papers from MME's The Sweetest Thing Tangerine Collection that I thought went well with the floral panel. Lastly I stamped my sentiment from the Friendship set and cut it into a little banner. Thanks for taking the time to visit me today! Enjoy the rest of your weekend! Welcome to the final day of our June release preview week at The Craft's Meow! You've seen all 4 of our new sets each day this week, and today we're having our traditional Blog Hop to show you how you can mix these stamps together! You should have arrived from Julie's blog, but if you'd like to start at the beginning, please go to The Craft's Meow blog for a list of all the blogs participating. Once you get started, you should be directed from one blog to the next. I know you'll love what my teamies have done with these sets! This time I turned the flower upside down from the way it appears on the stamp set, and I think they look even more like pansies! I love that this is a set that I don't have to color.....I let my colored inks and the various stamps do my coloring and detailing for me! You can now see and purchase all of our June sets at The Craft's Meow store! Would you like to win ALL of them? Just leave a comment on each of our blogs (you'll increase your chances that way) by 8 PM PDT on Sunday, June 23, and Lisa will choose a random comment from one of our blogs! The winner will be posted at The Craft's Meow Blog on June 24. Good luck! Now, hop on along to Nina's blog! Didn't I tell you you'd love this flourish? Here I let it take center stage, stamping it on some ivory cardstock, along with one of the sentiments, and then just added a store-bought rose and colored in the letters. I thought this My Mind's Eye paper was the perfect background, as it has swirls and flourishes in a much more subtle manner. For my second card, I stamped the same flourish twice on white cardstock, to be more in the background for this vellum flower I made, using the last of some thick beautiful pink vellum and Spellbinder's Rose Creations dies. I wanted an equally flourished sentiment, so I chose this one from our Lark Additions set, sprinkled some pearls, and added it to a pink card base. Wouldn't this design work nicely for a wedding card, using the bride's wedding colors? (Edited to add:) I'd also like to enter this card into the Moxie Fab World's Birthday Card Challenge, since this was created within a month of the challenge. Please visit The Craft's Meow blog to see what my team-mates did with this lovely stamp set. Leave a comment there by 8:00 PM PST tonight for a chance to win it! Lisa will be giving away a set to one lucky commenter at The Craft's Meow Blog! And please come back again tomorrow for our traditional blog hop featuring all of our 4 new sets this month (with a chance to win them ALL)! If you're here to see my cards for The Craft's Meow June release previews, please scroll down 1 post or click HERE. Happy Wednesday! It's time for another challenge at Simon Says Stamp! This week our theme is "Summer Fruits". The Design Team are using products from American Crafts, and we'd love to see them on your creations, too, but it's not mandatory to enter our challenge; just follow along with the theme. As usual, Heidi has offered another $50.00 gift voucher for the random winner of this challenge. What sweet things would you get there? I know you'll want to visit The Craft's Meow Blog to see my teamie's ideas on how to use this fun set! While you're there, don't forget to leave a comment by tonight at 8:00 PM Pacific time, for a chance to win it! I hope you'll come back tomorrow to see the last of the new releases! I put together several of the flowers, a bud, and some leaves, stamped them with colored inks, then cut out my little vignette. 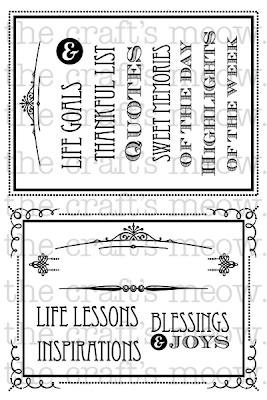 It was simply popped above a doily with some striped paper, ribbon, and I added one of the sentiments in this set. For this card I omitted the outline stamping to show you that these flowers are just as pretty without it, and give a bit of a water-colored effect when you don't use the outlines. This one uses my favorite sentiment from this set, bringing to mind the phrase that Anne of Green Gables used often. Don't forget to visit The Craft's Meow blog to see what all my team-mates did with this new stamp set. Leave a comment at The Craft's Meow blog by 8:00 PM PST tonight for a chance to win this new set! The winner will be announced on the blog tomorrow. And I hope to see you again tomorrow for another preview of one of our other new sets! Here we are at day 1 of The Craft's Meow June release previews! 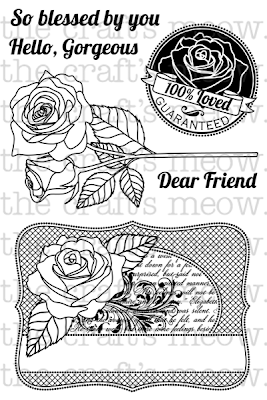 Today's stamp set is called Beautiful Roses, and it's designed by Nina B. There are 3 wonderful images (all with roses), and 3 sentiments, too; so appropriate for this month of roses! For my first card I chose this Rose spray and colored it like my favorite Peace rose. It starts out a lovely pale yellow, and gets pink edges as it opens. I remember this rose in my Grandfather's garden next door. I carried through the pink and yellow theme throughout my card, popping my 2 sprays above a tiny pink gingham edged with adhesive paper lace, and then added a yellow grosgrain bow and one of the sentiments. I used a sketch that I had pinned on my Pinterest boards, and papers from Basic Grey and Studio Calico, along with a wood veneer arrow. Please visit The Craft's Meow blog to see what my team-mates made for you today, and then leave a comment there by 8:00 PM PDT tonight for a chance to win this set . And come on back tomorrow for another preview of a June release! I started with that K&Company Susan Winget bird grand adhesions sticker. I've had it for years and decided I'd make it the focal point of my card. The papers I finally decided on come from so many collections, old and new: October Afternoon Sidewalks and 9 to 5, My Mind's Eye Stella & Rose Mabel and Bramble Rose, Fancy Pants Park Bench, and Basic Grey BowTies. I added some Hobby Lobby lace, washi tape from Michael's and stickers by Cosmo Cricket as my sentiment. It all came together once I decided on this Page Maps sketch that I had pinned. Without that I'd still be playing with my papers! This was really fun, Cath, thank you for pushing me out of my comfort zone; I'm going to try another one soon! Penny Black Stamp Squad Blog Hop! Welcome! I'm so excited to be participating in the first ever Penny Black Stamp Squad blog hop! Not only are we hopping, we're giving away stamps, too! Leave a comment along the hop at each stop, including the Penny Black Blog, for a chance to win a selection of Penny Black stamps. You should have come from Greta's blog. If you'd like to begin our Hop from the beginning, and for a listing of all blogs participating, please visit the Penny Black Blog HERE. I really love this background stamp called Indian Wheel! It will adapt to anything else you pair it with. 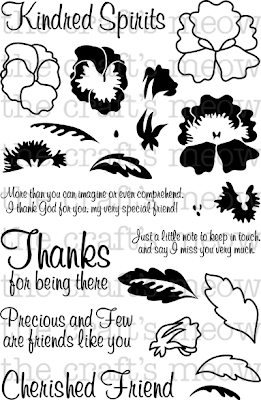 I used it here in a partial panel, and then stamped, colored and fussy-cut the beautiful poppies from Blooming Garden, and added my sentiment (from the Friendship set) in a banner form. Love these corals! Now, please hop on over to my sweet friend Judy's blog, Livin' the Dream. I just know she'll have something amazing to show you! I'd also like to enter this card into the Cloud9 Blog Hop, their last, sadly, which is Anything Goes. Here's a card made using materials from Simon's June Card Kit, now sold out AGAIN! (but you can get these elements separately, if you'd like.) For this card I chose some of the lovely papers from the included Basic Grey Hipster papers, along with the wood tag - isn't it fun? And then I added my own die-cut butterfly and some enamel dots, pulling out some of the colors from the papers. Love this dark chocolate with the aqua, don't you? This one uses a part of one of the Hipster Snippets along with stamping from the Kelly Purkey stamp set "Dude!" included in the kit. I just added my own twine and another enamel dot. Isn't that "Shattered" Tim Holtz Core'dination panel nifty? All of the papers are from Basic Grey's BowTies paper pad. I added some Studio Calico Transportation wood veneer shapes that I colored with inks to match the papers, and some die-cut letters using my Die-Namics By the Letter dies. 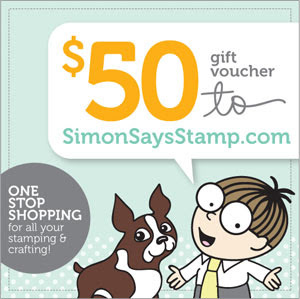 As always, our Heidi is offering up another $50.00 gift Voucher to the Simon Says Stamp store! Also we have a Simon Says Stamp Summer School currently happening over on the Simon Says Stamp Blog ! Lots of fabulous designers are taking part and there are lots of Goody Bags to win !! Hello, friends! I've been keeping a little secret for a few months that I've been bursting to reveal, and today I finally can! I've been invited to be a part of the brand new Penny Black Stamp Squad!! There will be 5 of us total, and we're all so excited to be able to share our love of Penny Black stamps with you! Here's a little sneak peek of my card that will be featured on the Penny Black Blog today. I hope you'll visit over there and say hi, and then come back there every day this week to meet another of my new team-mates! Skidding in by a hair! I was thinking I had more time for Cath's Tuesday Trigger this week, but I don't, so here is my second entry for this beautiful Trigger. 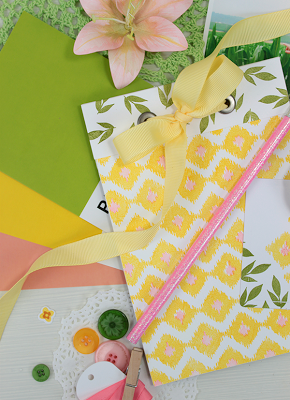 supplies: yellow cardstock, dps from BoBunny's Soft Shades Double Dots pad, Wplus9 Blanket Stitched Blooms, PTI's Friendship Jar (sentiment), Darice Simple Interlock embossing folder, paper doily. Just LOVE these pastels with the sunny yellow and that crisp white! Thank you, Cath! Simon Says.......Masculine or Father's Day!